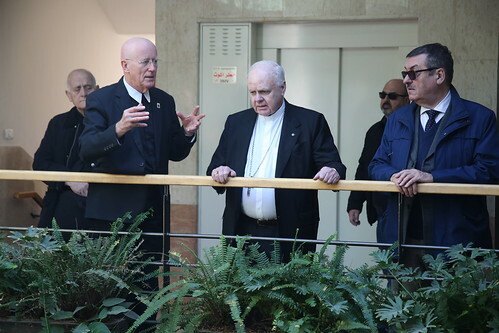 The Grand Master of the Equestrian Order of the Holy Sepulcher of Jerusalem (EOHSJ) His Eminence Cardinal Edwin F. O’Brien and the Governor General of the EOHSJ His Excellency Ambassador Leonardo Visconti di Modrone visited Bethlehem University on Monday, 4 February 2019. Vice Chancellor Brother Peter Bray welcomed His Eminence and the group members whose presence on campus reassured the students that their struggles, aspirations, and hopes are being heard. Brother Peter acknowledged through a presentation the support of the EOHSJ to the University over the years. Visibly happy to be touring campus, the group was delighted in the opportunity to meet some Palestinian students before heading back to Italy. During their discussion with some of the students, members in the group were encouraged by the positive impressions the students gave about the University. Their visit ended with lunch at the training restaurant of the Institute of Hotel Management where they enjoyed some delicious food and the service of the students. The EOHSJ is an international Catholic order that supports Christians in the Holy Land and a long time close friend and supporter of the University. Their continuous support contributed to many projects and scholarships at Bethlehem University.